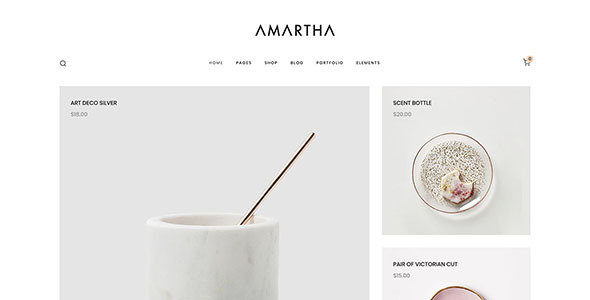 Amartha is a Modern and Clean WooCommerce WordPress Theme which will make your eCommerce website a high-class store with nothing that misses. The interactive and well-built demos that are built with love and passion by our team are something that everyone will love. The joy of Amartha is the most powerful front-end page builder Elementor, everything can be created simply drag & drop. 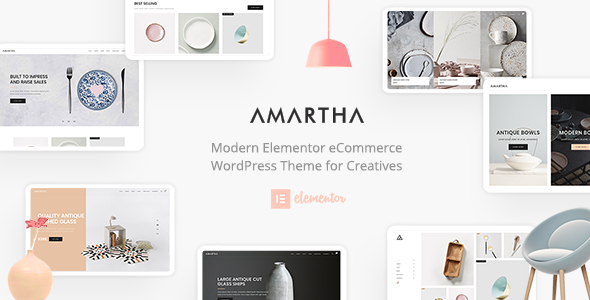 Unlimited header and footer possibilities via the header and footer builder, there are simply no limits with more than 50 elements, copy-paste feature, template library and much more are only some of the features of Amartha. Elementor – The World’s Leading WordPress Page Builder. Elementor is the ultimate WordPress page builder, the key difference is that you can reach a high level of design while designing live and on the front end of your site. Elementor is a page builder plugin that replaces the basic WordPress editor with a live frontend editor, so you can create complex layouts visually, and design your website live, without having to switch between the editor and the preview mode. The page builder enables you to reach a top-notch quality of design without needing to use code or CSS and doesn’t require code knowledge. Header & Footer Builder – No limit when it comes to headers and footers, you’ll be able to create an interactive header and footer layout via Elementor with the elements that we created to make it even easier for you, pre-defined headers and footers can be included in the template library in only one click. WooCommerce – WooCommerce is for selling products and services. Specifically, it makes doing these things affordable and accessible. You can sell digital and physical products, manage inventory and shipping, take secure payments, and sort taxes automatically. Customizer – With the very powerful innovative WordPress Live Customizer you will be able to preview the changes made to your WordPress website in real time before pushing them live. Lots of options will make it a breeze for you to modify the structure and the visuals of your theme, including color scheme, typography, portfolio, blog, shop layout, and much more. 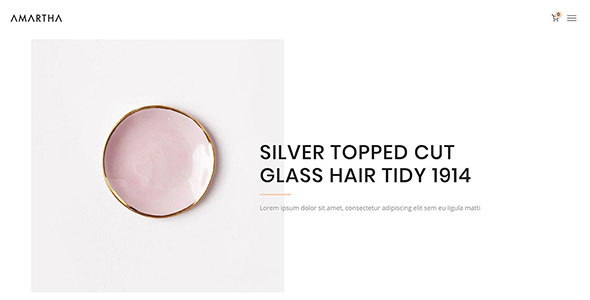 Revolution Slider – Slider Revolution (Revolution Slider) is an innovative, responsive WordPress Slider Plugin that displays your content the beautiful way. Whether it’s a Slider, Carousel, Hero Image or Video Scene for best conversion rates or even a whole Front Page, the visual, drag & drop editor will let you tell your own stories in no time! Desktop or mobile device! It’s included for free, you’ll save 26$. Template Library – Save your page designs as templates, and reuse them on other pages. This can really speed up your workflow. You can export any template, and import it for use in other websites. This lets you share your templates with other designers. One Click Demo Importer – A very handy feature which is added to the theme, you can import any of the demos of live preview in only one click, it won’t take more than a minute to set up. You’ll enjoy adding your content and playing with design, rather than creating everything from scratch. Fully Responsive – Everything on theme is built with high responsibility, responsive is on the top of that list with every element responsive & retina ready. Hundreds of options – Theme offers more than 500 different options and shortcodes, all of them are combined together to create a beautiful website for any purpose. Advanced Typography Options – More than 600 different google fonts to choose from, highly advanced settings for each element in options. Amazing Speed – Well organised template hierarchy offers incredibly fast loading time. Shape Dividers – A very powerful feature added to the section offers a very beautiful way to create your pages with amazing layouts on the top of the section or at the bottom. Powerful Grid Layout – Plenty of options like type, style, spacing and much more are included on the three different grid types blog, portfolio, and shop. 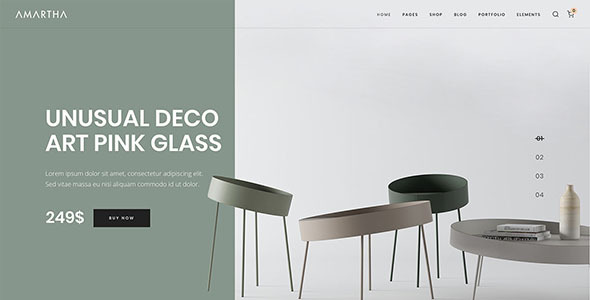 Clean Design – Light colors are combined together to bring a simple and beautiful designs for any purpose like freelancers, agencies, designers, architects, photographers and much more. Amazing Portfolio – Are you interested to make your portfolio look cooler. Showcasing your portfolio never was easier, combine easily hundred of options created by powerful theme panel and the best page builder elementor, you’ll be able to choose between three different layouts, grid, metro or carousel, each one has their own amazing options. Creative Blog – Create your articles in a creative way, your audience won’t be bored with the incredible layouts included on the theme, use the regular grid system or the beautiful types like masonry, metro or the carousel. 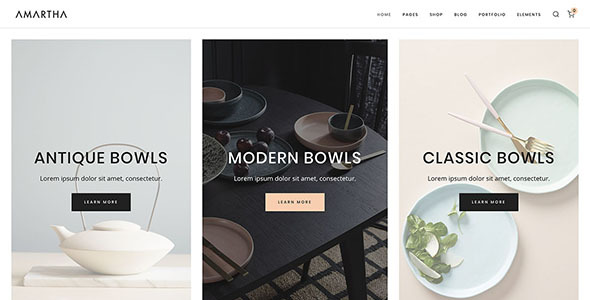 Powerful Shop – Start selling your products in some great looking grids, with plenty of options that can be mixed together. 50+ Elements – Amazing elements ready for use in the front-end page builder Elementor, everything drag & drop. Ajax Mini Cart – Ajax Mini Cart allow customers to view and manage contents in cart easily. Customers can continue shopping without reloading page. Items in the cart can be managed easily from the Mini cart. It also sync with the cart page using Ajax. Parallax Effects – Parallax scrolling is a web site trend where the background content (i.e. an image) is moved at a different speed than the foreground content while scrolling. Click on the links below to see the difference between a website with and without parallax scrolling. Fast and Reliable Support – To have someone cover your back 24/7 is really something when it comes to the questions that are related to the product. The satisfaction of the client is what motivates us to work more and more. Currently, our author rating from our clients stands at 4.98 from 5 with more than 240 reviews with 5 stars. Start by creating a ticket at our support system at here. Inherit Option – Most of the options in the elements have the option to inherit the values from the theme options. With this option, you can create multiple pages or have multiple elements with the same settings inherited from the theme options. No worries, inherit is not the only option from the select, the inherit option usually stands at the top which is followed by the normal options. No coding knowledge required – There are options for almost everything, no extra knowledge is needed to build the website of your dreams. Auto Updates – Compatible with the Envato Market Plugin, the theme can be updated easily with only one click via the dashboard menu. Visual Editor – Edit the paragraphs, headings, lists and much more elements in real-time. Translate Ready – Ready to be translated in any language, it fully supports all multingual plugins like WPML, Polylang, Loco Translate and much more. Mega Menu – Advanced options on the menu item make it very easy and quick to make it mega menu, no need to add extra classes for columns and activation, there are simple options to choose. Unlimited Google Maps Styles – Embed your google map in very easy steps, you can stylize easily the map choose the color, saturation and many more CSS filters. Adaptive Images – Image size attributes are well organised to enhance responsive image functionality. Professional Documentation – The documentation is to help you regarding each step of customization. Please go through the documentation carefully so you can understand how this theme is made and how to edit this properly. The images from live preview are not included in the package. View the full changelog here.